This is not a review of Dinosaur Bar-B-Que. It could be, ethically. 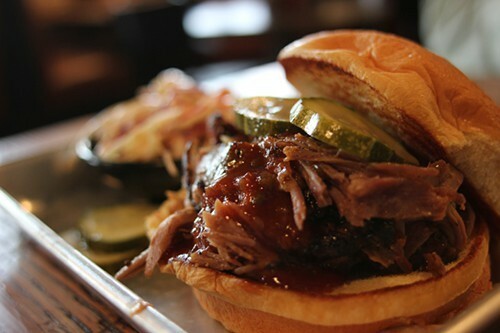 Although the massive smoked meatery, which originated in the barbecue bastion of Syracuse, New York, and now has a location in Chicago's own shopping tar pit at North and Clybourn, had a preview for media folks, I was not among them. And when I went for lunch, I paid with my own money, was recognized by no one other than the friend I was meeting there, and did not receive a bottle of Wango Tango sauce under the table from the manager. In any case, Mike Sula will probably officially review it at some future point. This is just a post about what it got me thinking. Because even if I met the time-honored ethical standards of the newspaper review, which must go back at least 20 or 30 years and are treated as if they were handed by Moses to Craig Claiborne himself, my reaction didn't meet my own ethical standards. In short, I came out with a negative impression, and I'm feeling kind of negative about why that was the case. Setting the scene: Dinosaur Bar-B-Que is tucked back on Weed Street, close to where the original Bub City was 20 years ago. I remember going to a joint on Weed long ago and watching some guy in a red polyester suit blow away a tightly packed club with his blues guitar. I also remember thinking he would probably make $50 that night for his performance, as that was just the way of the world. Well there's more money in that part of Chicago now, believe me, from the Apple Store to the Anthropologie to the Pottery Barn. It's a regular mall from the North Shore around there these days, selling more than just stuff—selling lifestyles. And so is Dinosaur Bar-B-Que. The brick building with faux-faded painted signs is designed in full faux honky-tonk. (Hauxnky-tauxnk?) Which, frankly, so was Bub City 20 years ago, and is again now in River North. 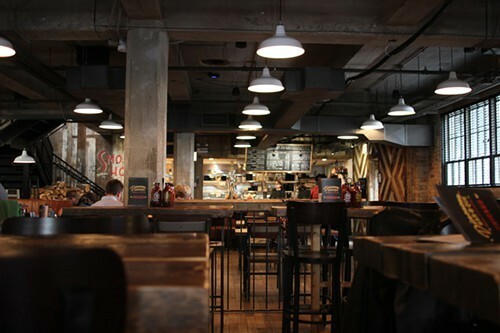 But Green Street Smoked Meats has set a new bar for fauxing honky-tonks; it's immersive and gritty, and it feels like an episode of True Blood could break out at any moment. The Ed Debevic's/sports-bar feel at Dinosaur Bar-B-Que is comfy enough, but nothing you haven't been to before, many times over the last 20 years. But there I go getting snarky, too hip for the room. I don't like that. So let's acknowledge that the room is built for a good time, and even if it's pretty prefab (it is a chain, after all), you should be able to enjoy yourself just fine here. The service is good and friendly and attentive, and the barbecue—oh yeah, food—strikes me as pretty good, what I tried of it. I had a platter of pulled pork and brisket (the sandwich above was my dining companion's) and both had good smoke flavor and bark, the sides and sauce were not overly sweet, and as north-side barbecue goes (note my subtle use of geographic code for the racial distinction I don't want to overtly make just yet; I have a future in Cook County politics), it'd make for a perfectly pleasant, get-out-of-the-office lunch. Well, it would except for one thing. Parking is $14 for valet and $12 to park yourself in a muddy field that someone cynically stuck a parking machine in (and it would be hilarious if that was just a brilliant con and they didn't actually own the lot). Because of that, which is basically unavoidable in that area even on a Tuesday at lunch, I effectively spent $35 for a smallish platter of meat (definitely less than you'd get at Smoque, say), some beans, coleslaw, and a corn muffin. Should I hold that against the restaurant? It seems wrong to—should I hold it against Berthillon that it costs me $1,000 to fly to Paris to eat their ice cream?—and you could bike there, hike there, or take the Red Line for less, certainly. Yet Dinosaur is such a part of this neighborhood's fast rise as a home to expensive chain faux experiences that I can't completely divorce them from it either. And it is a problem that I have had with many reviewers, when they're not very connected to the reality of people who pay for their own meals. I've blown absurd money on trifles (or at least truffles) in my time, but I think if you're a reviewer and you're finding, say, a martini glass' worth of ceviche simply delightful for $50, you need to at least factor in how many hours some of your readers would have to work for those four or five bites. But now we risk opening a whole can of worms about authenticity and cultural appropriation, which I fear deeply because we're already seeing people start to see racism in white boys making tacos or whatever, and balkanizing food that way will be the death of food culture (and other parts of our culture, not long after). What brings us together is that at some point all cultures are our patrimony (in a non-gender-specific way, of course). If it's wrong to make tacos (or takoyaki), next it'll be wrong to eat them, and pretty soon it's racist to eat other cultures' foods and listen to their music and spend money in their restaurants (not that they were ever asked their views on the subject). At that point, I'm giving up and wandering off into the desert like John Wayne at the end of The Searchers. So I give a qualified endorsement to the idea that you can get barbecue at least as good for less money in neighborhoods where the parking is $14 cheaper than it is in the North and Clybourn corridor. You'll be experiencing something more real about our city and its many cultures, and you'll also be supporting local businesses and the economic vitality of what are often somewhat disadvantaged neighborhoods. That said, I won't hold it against you if you try Dinosaur Bar-B-Que (take the el; it'll be cheaper). It's pretty good for a chain. Man, food is complicated. I'm glad I'm not a reviewer. The owner of Steamboat Barbecue in Wheaton, John Bovinette, visited 47 states to learn a variety of techniques for smoking meats. A smartly concepted South African chicken chain launched today on Randolph Street.